If you’ve ever asked yourself “How many bank accounts should I have?” or find it difficult to manage your money in general, you’re not alone. According to one 2017 survey, nearly 8 in 10 Americans currently live paycheck to paycheck. Luckily, there are many things you can do to improve your situation and alleviate that financial stress. Can You Have 2 Bank Accounts with Different Banks? How Many Bank Accounts Should I Have in Total? One of the easiest ways to alleviate financial stress is to open multiple bank accounts and use them accordingly. It’s perfectly acceptable to have multiple bank accounts for budgeting. But how many bank accounts is enough, and how many is too many? The answer to the number of bank accounts you should have depends on your individual situation. Most people are fine with just a few bank accounts at first. As your needs change, you might find that it’s easier to budget your money with more accounts. Let’s talk about what those accounts are and how to use them. Most everyone knows they need at least a checking account to hold their cash for day-to-day use. Single people and married couples who manage their finances jointly may only need one checking account. Some married couples, however, find that splitting their finances up into three separate checking accounts — yours, mine, and ours — works best for them. If one spouse is a spender and the other is a saver, this can be a good solution. Of course, it then requires both spouses to manage their checking accounts independently. One or both partners will also have to manage the joint checking account to pay shared bills like utilities, rent/mortgage, etc. This account setup adds new complexity to the situation, but for some people, the benefits outweigh the drawbacks. Savings accounts generally offer a lot of helpful benefits that are custom-designed for the job. For example, savings accounts offer higher interest rates and have limits on how often you can withdraw money. Keeping your savings separate from your spending money (i.e. your checking account) also ensures you don’t accidentally spend your money on impulse purchases. Most people have at least one savings account as well. However, if you’re living paycheck to paycheck, go into debt frequently, or just want to plan things out better, you might find that opening multiple savings accounts for different purposes works better for you. This is known as the “bucket” savings strategy. Most banks and credit unions will let you open multiple savings accounts to achieve this. Many people find it helpful to keep a separate savings account specifically for an emergency fund. This money is for events such as unexpected car repairs, job loss, or emergency hospital visits. It’s like a fire extinguisher in a glass case: you only break the glass (i.e. withdraw the money) in a true emergency. If your emergency fund is mingled in with your savings for other accounts, you risk inadvertently withdrawing the cash. As a result, you could find yourself in a sticky situation when a true emergency arises. Again, separating these savings ensures that you don’t accidentally use them for the wrong purpose. It’d be a shame to save up money for a nice vacation only to find you accidentally spent the funds on something else and no longer had the money to purchase your tickets. It’s also a good idea to have investment accounts for your future, such as for retirement or a house down payment. Unlike an emergency fund, these are planned expenses that will come to pass. However, they’re still years in the future. Many people invest their savings in equities such as stocks, bonds, index funds, and mutual funds. These investment accounts generally allow your money to grow to a much greater value over time. On the other hand, they’re not insured, and there’s also the possibility that you’ll lose a great deal of money. That’s why a lot of people prefer to keep their investments in a bank account where it earns a smaller (but guaranteed) rate and is insured. There’s no right or wrong answer, and we encourage you to speak with a financial advisor for these big life decisions. However, since we’re on the topic of bank accounts, there are a few you might consider adding to your arsenal. Certificates of Deposit (CDs, or “Share Certificates” at credit unions) are timed deposit accounts. When you open a CD, you deposit a set amount of money into your account, typically $500 to $1,000 or more. You agree to hold that money in the account for a set period of time, ranging from a few months to several years. During that time, you’re not allowed to withdraw or access the money in your account. If you do, you’ll be charged a penalty. Once your CD matures, you’ll receive your original deposit plus the interest earned on your account. CDs generally offer higher interest rates than any other account type at a bank or credit union. Because of the timed deposit feature and higher interest rates, these accounts are especially good if you already have a large amount of money that you won’t need until a later date. Money market accounts work much like savings accounts. They typically require a higher deposit than a savings account, but they also come with higher interest rates. Unlike a CD, you can withdraw funds from your money market account whenever you want as long as you stay under the monthly withdrawal limits. The interest rates on these accounts are typically between that of a regular savings account and a CD account. These accounts are especially good if you have a higher dollar amount to save but still may need to access it at any time. If you have a large emergency fund, a money market account can be a great place to store it. Some banks and credit unions also offer traditional investment accounts in addition to the equity investments mentioned above. These can be great ways to grow your long-term savings such as your retirement funds. However, keep in mind the fees that a bank or credit union may charge for these accounts. Banks and credit unions may charge a higher fee than working directly with a brokerage such as Vanguard or Fidelity. If you’re using these investment accounts to supplement your retirement savings, it’s usually enough to have just one Traditional IRA or a Roth IRA account. 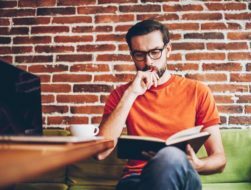 If you’re self-employed, you may also be able to choose from other retirement savings accounts, such as a SEP IRA or a Solo 401(k). There is no right answer for everyone. How many bank accounts you should have depends on your individual situation and your financial goals. 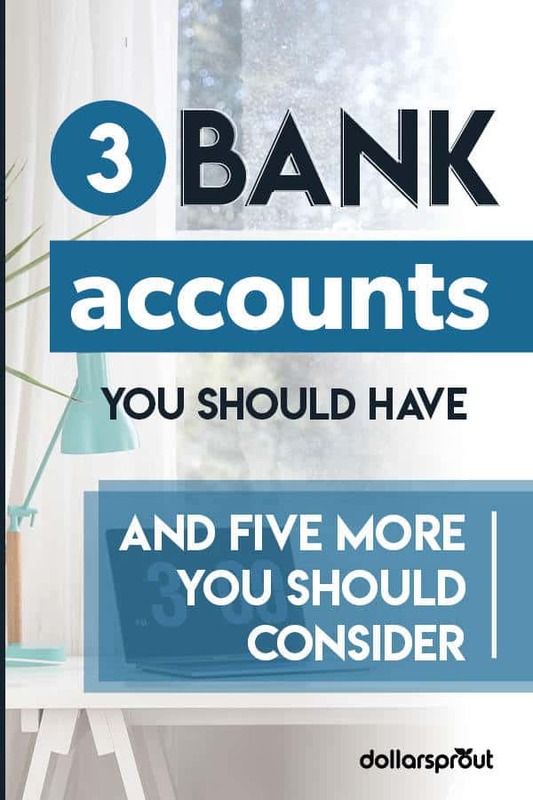 Most people prefer three bank accounts at a minimum: a checking account, a savings account, and an account for retirement savings (although this can be held at a brokerage instead). 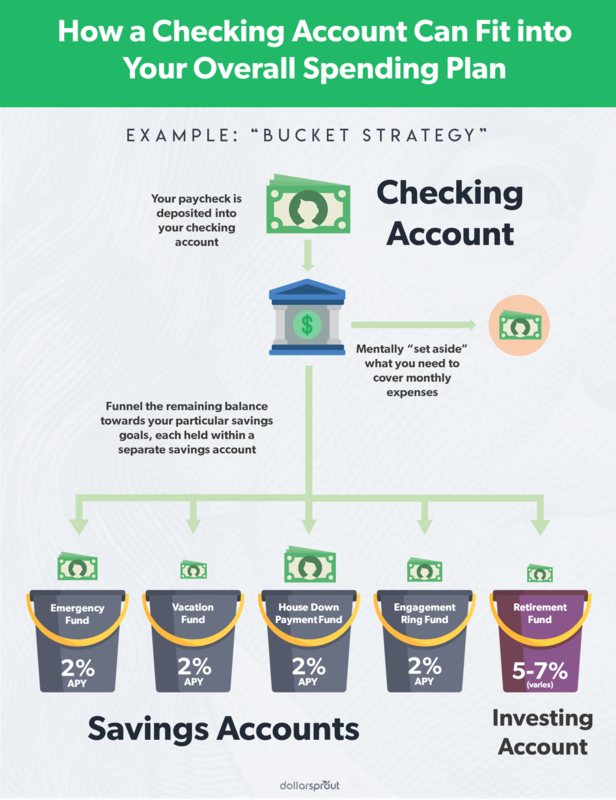 In practice, most people are better served with this minimum three-account setup plus at least a few extra savings accounts for long-term and short-term savings goals. Married couples who find it difficult to manage money together may also want to keep individual checking accounts. 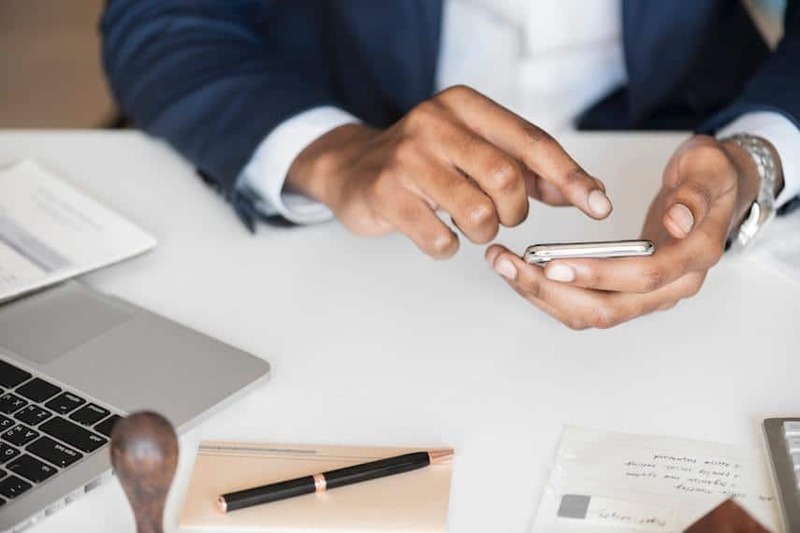 When it comes to managing your finances, oftentimes keeping it simple when it comes to the question of using multiple bank accounts for budgeting is the best solution. Minimizing your number of accounts will help you stay organized and manage your money with confidence.